The Itty Bitty Kitty Committee: Wylla Stout - Larger Than Life! Wylla Stout - Larger Than Life! If you happen to find yourself at the corner of South 35th and South Tacoma Way in Tacoma, look up! You'll see our wee Wylla, larger than life, on a Humane Society billboard. 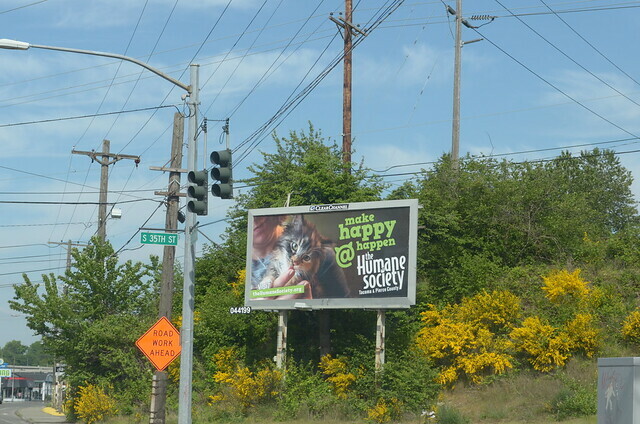 She's one of five Humane Society critters featured on fifteen billboards sprinkled throughout Pierce county. It's a sweet campaign and we're happy that Wylla was selected to be part of it. Wylla has been doing great the past couple of weeks. She's now at 2.75 pounds and is starting to get a little more meat other bones. I was hoping to get her to three pounds before we had her spay surgery done, but she is five months old now, and at the rate she's growing, she could go into heat before she hits that mark. Her body condition is good, and her doctor gave us the green light, so she'll be having her surgery this weekend. And after surgery is done, we will officially make her ours and fill out the adoption paperwork! That will be an exciting day! Here's to an eventless surgery and a super-quick recovery! I'll be thinking of Wee Wylla this weekend. Yay Wylla! Warm furry prayers for speedy recovery. Tell Mom you really want to get that Family Portrait soon! 5 months already? Time flys for the super cute. Our Kitties are sending good thoughts her way. Good luck with the snip-snip this weekend. My kitty was about that size when she had her operation ... they shaved her teeny tummy and she had two itsy-bitsy stitches; it was so cute. Although she did spend the whole day after the procedure curled up in a corner grumping in my general direction, lol. Of course Wylla was chosen for a larger-than-life photo -- she is the most adorable kitten ever in the history of the world! Best wishes for your surgery this weekend, Wylla. It's such an important rite of passage for a little girl, because then you can officially become a member of the family! I have passed one of the other billboards frequently in the last couple of weeks. Every time I do, I look up at it and smile -- and then wish it was the one with Wylla on it. :) Good luck with your surgery, sweetie! Gorgeous blue skies, scads of lovely wildflowers and lush foliage, yet still...Wylla is the most beautiful part of that picture. She's going to do great, I know it. Yay, Wylla's a star! But we already knew that. It was only a matter of time until the rest of the world figured it out. Good luck with the surgery this weekend. Looking forward to the official announcement. Purrs for a quick recovery Miss Wylla, and we can't wait to see your "graduation" photo with the yellow medal! I love that Wylla's already attracting billboard attention! Hope she does well in surgery! God speed little one -- hope your surgery will go well this weekend and you will be playing with your sister in no time at all. Keeping you close to our hearts. If you need someone to vouch for you on your adoption paperwork, let us know. I think we can safely say you and Craig will make excellant parents. And congrats to Wylla and her billboard. Wonder how Charlene likes her bus photo being upstaged. What an awesome sign to see if you are in the area - thanks for sharing that with us. There's just something so special about a wee kitten who you are trying to get bigger every day, now being shown to the world in such a very big way! Looking forward to reading the good news that all went well with her surgery and hopefully seeing her with her official gold medal of adoption after it's done! Yay for Wylla!!! And you, Craig, and Charlene, too! Blessings on all of you! Have a safe and successful surgery, little Wylla. We'll all be holding your hand in spirit, Laurie. I can't wait to see the picture of Wylla with her little yellow tag in the arms of her official family! Hmmm, I wonder if someone would be permitted to drive the van over for the family portrait? That would be such a cool photo! Oh....and good luck on your surgery Miss Wylla! I can hardly wait to see that shaved belly! Supermodel kitty. She's had a lot of practice. And...she's been flipped! Her orange is on the other side! She is a true star :) Hopes and prayers for a successful surgery and recovery for Wee Wylla - although she is growing so fast we can't call her that for long. Can't wait to see her in the famous yellow tag... happy weekend everyone!! Yay for Wylla! It's so good of her to lend her image to such an important cause. I'll cross my fingers that her surgery goes well. I too am amazed that she is already five months old. Where does the time go?! Go Wylla! What an adorable bulletin board. So happy for you all! Thinking good thoughts for the spay surgery and the official adoption. Yay! How neat! I hope she has a good and quick recovery from surgery! That's a big milestone for Wee Wylla! I don't know if it's true for all cats, but every one I've had fixed immediately gains a little weight, so maybe she'll gain a bit. Fingers and paws crossed! Prayers for a quick recovery, Wylla! Congratulations Wylla!! You look lovely on the billboard :) What a star!